One of the most significant nineteenth century Australian artists, Conrad Martens was Sydney's pre-eminent landscape painter from his arrival in 1835 until his death, some forty years later. Born in London, he studied with Copley Fielding (1787-1855) and in 1833 joined the scientific survey expedition of the 'Beagle' in Montevideo, South America, replacing its ailing official artist Augustus Earle (1793-1838). The naturalist on board was Charles Darwin (1809-82); he and Martens became friends and later corresponded. Martens left the ship in Valparaiso in 1834 and made his way to Sydney via New Zealand. 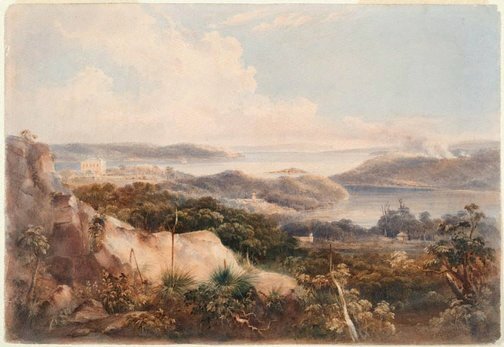 Sydney Harbour and its environs became his favourite subject, obvious from his many drawings, watercolours and oils. Within a year of his arrival he also painted in the Illawarra and Blue Mountains, later travelling further afield to Brisbane and the Darling Downs, New England and Hunter regions of NSW. Martens attracted patrons from the colony's elite, undertaking commissions and taking students. In order to secure himself financially late in life, he became Deputy Parliamentary Librarian in 1862. This is one of 24 watercolours by him in the AGNSW's collection. Signed and dated l.r., brown watercolour "C Martens/ 1836". 19th century Australian watercolours, drawing and pastels from the Gallery's collection , Sydney, 2005, 28, 29 (colour illus. ).